ORMUS ~ The Secret Alchemy of Mary Magdalene Revealed “Part A” entices adventurous readers to immerse themselves in emerging historical induction, recasting ancient narrative in a wholly original light. “Part B” of William Hearth’s engaging history study series arrives concurrent with a compulsively readable romantic novel. Hearth is publicizing the arrival of the books in a novel way. He has completed a 40-day vegan juice-fast designed to demonstrate that these ancient ideals, remain valid, as a way forward today, and are applicable in averting imminent environmental collapse. Hearth is planning a follow-up fast of 60-120 days, commencing mid-November 2010. No historical figure is as polarizing as The Magdalene. Is she a harlot and a witch, as Orthodox tradition depicts her? Or was she Jesus’ consort, “The Holy Grail,” as others suggest? For Hearth, she is a priestess and alchemist: an environmentally conscious vegetarian, and precursor to the proud traditions of both environmentalism and feminism. “Part A” of ORMUS ~ The Secret Alchemy of Mary Magdalene Revealed is now available. It focuses on how history is written and rewritten to serve the power brokers in any given era. “Part B” (forthcoming) targets, more concisely, the specific philosophies of Mary Magdalene and Judas Iscariot. They are viewed as strong religious leaders, rejecting animal sacrifice, whilst espousing complimentary, compassionate (pacifist), oriental-faith traditions. “The Novel” which follows “Part B” is an imaginative narrative, which implies that Judas Iscariot is a disciple of Jesus, who unwitting falls in love with The Magdalene. Judas’ role as part of the Sicarii or Dagger Men, a group of Jewish zealots strongly committed to expelling the Romans from Judea (using Sicarii, or concealed daggers), merits special attention. Hearth is showing those ideals are still valid. He has just completed a 40-day vegan juice-fast in hopes of drawing attention to his work and to show that humans are capable of living lightly on the Earth. 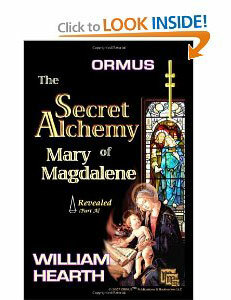 ORMUS ~ The Secret Alchemy of Mary Magdalene Revealed, “Part A” is available now from Amazon.com. “Part B” will follow this Christmas and the novel in spring 2011. With these books, Hearth makes a stunning, original contribution to both scholarship and to ancient historical fiction and romance.